In an interview in India Today, the great Indian ﬂautist, Hari Prasad Chaurasia made a remark about his simple instrument that struck me at the time for its poetic imagination. I regrettably don’t recollect his exact words, and my copy of the magazine has long since passed on to the local rag-picker, but I think it went something like this: that the ﬂute was the instrument whose music was the most purely spiritual, the one that took him closest to God. It did not require strings, reeds, or membranes to produce its melodies, just holes — emptiness. It seems to me that Nawang Khechog is attempting such a symbiosis of instrument and spiritual expression in his music. Not only is he a specialist in the transverse ﬂute, but he also plays a number of wind instruments from all corners of the world. He has mastered the didgeridoo of his present home in Australia, and also pan-pipes and ocarinas from South America; all instruments that depend on “voids” of one sort or the other for the source of their resonance. But the spiritual claims made by Nawang Khechog for his music do not stop at just this particular quality of his instruments. By his art he seeks to achieve one of the primary objective of Buddhism: a peaceful state of mind. “I try to create a mood of peace and harmony that frees the mind of anger jealousy and greediness.” A tall order? Well, Shakespeare didn’t think so. What worked in his days on “savage breasts” and “restless spirits”, could certainly be capable of assuaging the more pliable souls of New Age folk. 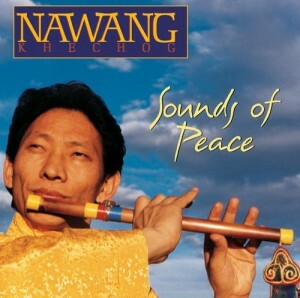 Though I have not had the pleasure of hearing Nawang Khechog live, I am assured by someone who did, at a rock concert at Bondai beach in Australia, that after the ﬁrst few notes from his ﬂute a rather frenzied audience of many thousands calmed down to listen to his music in relative silence. It also seemed that this paciﬁc mood was not just conﬁned to the sort who, at such events, invariably comport themselves in full lotus position and go into deep meditation, but also spilled over to the more raucous realm of heavy-duty yobs clutching litre cans of Fosters. A music critic for the Erie Showcase Entertainment Guide wrote that: “His (Khechog’s) ﬂute playing mirrors a common experience I’ve had in meditation over the years. When I ascend into the space between thoughts or breaths, I feel more peaceful, joyful, and expansive. This inner state is expressed with integrity and purity by Khechog.” Khechog seems to have received a uniformly friendly press wherever he has performed, though unfortunately most of the write-ups seem to be just variations on the outpourings of our Erie reviewer; more revealing of the emotional and spiritual confusion of the writer, than of the actual music of Nawang Khechog. So what is his music really like? I falter at providing an answer. Music is one of the most subjective of arts, sublime harmonies for some being intolerable cacophony for others. But probably the best way to understand his work is to ﬁrst strip it of all the accretion of New Age verbiage that has grown over it like barnacles, in the last few years. A Tang dynasty artist once complained that people were judging paintings with their ears. In our day and age such shabby deceptions are perpetrated, at least in the case of music, with the eyes, or, to be speciﬁc, through reading review columns. But even having accomplished a decent de-barnacling job of Khechog’s music in my head, I cannot emphasize enough how ill-qualiﬁed I feel to say anything deﬁnite about his work, except to make a very personal and subjective interpretation, which, I do not hesitate to state, could be equally and justiﬁably held up to ridicule and castigation. But since Khechog is the ﬁrst Tibetan musician I know, creating and performing this kind of experimental music, I would like to pay him the highest compliment I can, by discussing his music seriously as music, and not as anything else. I enjoyed listening to his three albums and was intrigued by the quality of the sounds, not least for the very Tibetan, sometimes autobiographical undertones present in them. The inﬂuence of Tibetan ecclesiastical music was clearly apparent throughout his works, though subtly altered to remove the more dissonant and “primordial” (Anagarika Govinda) qualities of that tradition, especially the thunderous clatter and roar of drums and cymbals. Khechog’s ﬂute compositions evoked on one level the tonal qualities of gyaling (double reed oboe) music. As I was listening to The Sounds of Inner Peace, this sensation was reinforced by the sounds of actual gyalings that drifted over to my house from the nearby Namgyal Monastery. Nawang was a monk at Dharamshala for eleven years and such sounds must have constantly been around him. At other times, his ﬂute music veered off into long plaintive melodies that harked at Khampa lu songs, perhaps drawn from childhood memories of a free nomadic life in Eastern Tibet. They were the most ﬂeeting of impressions, but once or twice I thought I heard the trills of pahari, or Indian hill music, weaving into his compositions. Did Nawang take his ﬂute and wander about the mountains in Dharamshala, listening to the music of the Gaddi shepherds? One of his compositions on the pan-pipes, a wonderfully ﬂowing, rippling and bubbling impression of the course of some Himalayan cataract, also left me wondering about the many hours he had spent by the waterfall and river at Dharamshala, unconsciously absorbing its movements and resonance. With the didgeridoo of the Australian aborigine, Nawang reproduces the deep bass sounds and thunderous blasts of the dungchen, the Tibetan giant horn, though once again his interpretation, though seemingly derived from a Tibetan monastic tradition, is clearly and uniquely his own. I suspect this magniﬁcent instrument, with its other-worldly roar and its roots in the dream-world of the native Australian, of being the show-stopper in his performances. Clearly children love the sound of the didgeridoo, as a write-up in the Hartford Courant reports of Khechog’s concert at a school at West Hartford, Connecticut. Besides schools, Nawang has played at a range of venues from a zoo in Sydney to the UN General Assembly Hall, and also at various concerts with other musicians such as Philip Glass and Joan Baez. Clearly Nawang is beginning to make his mark on the “alternative” music scene, and his tour of the United States last year (one of his sponsors being Richard Gere) has provided him with a wider international audience than before, when he just performed in Australia. The New Age treacle is well and truly smothering everything of value in Tibetan culture at present, from the highest tantric initiations to the lowest bass register of Gyuto chants, and it is perhaps asking too much of one lone Tibetan musician out in the West, not to sink into it, especially when lamas are happily diving head-ﬁrst into the stuff. But it is nonetheless a pity, for Khechog’s seems to me one of the most original of all contemporary Tibetan music. Because of its experimental form and its attachment to the idea of peace and mental harmony, it does, on occasions, tend to become repetitive and uncertain of its direction; but all music of this kind faces such problems. How many Kitaro albums can you listen to without yawning? An excessive use of the reverb blurs the intention of Khechog’s compositions on a number of occasions. Khechog is one of the most interesting of contemporary Tibetan musicians not only because his work is created on the cultural and spiritual structures derived from his own traditions, but also because it is genuinely innovative. These innovations have substance and, to use a favourite Tibetan diorism, khung-lung, meaning that they have deﬁnite sources as well as continuing traditions; such, to a Tibetan way of thinking, being fundamental requirements for the successful pursuit of any worthwhile human activity, cultural or spiritual. Western obsession with novelty, self-expression (but does the self really exist? ), and “creativity” have yet to substantially inﬂuence Tibetan society and is still greeted by many of its members with incredulity and mild derision. As Khechog’s innovations are, in the main, derived from the threatened cultures of native Australians and South American Indians, people with ancient, yet not classically formal, musical traditions, the sympathetic vibrations running through these diverse traditions do lend to a satisfying unity and wholeness with the Tibetan elements of Khechog’s compositions. Currently, Hong Kong–Taiwan pop inﬂuence of the most whiny and tinkly sort seems to have taken over the development of modern music in Tibet. Unfortunately, this craze does not seem to have adversely affected the dominance of the pseudo-classical, pretentious, boring but ideologically correct sound exempliﬁed in the compositions of Aram Khachaturian (Ode to Stalin), Xian Xinghai (Yellow River Cantata), and Nie Er (March of the Volunteers), that still permeates Chinese music in the PRC, and which has considerable inﬂuence on Tibetan music in Tibet as well as in exile. New Tibetan composers in exile, namely in Germany, Switzerland and India, have made the beginnings of an effort to create a popular new music form, often basing it on old Lhasaen tunes and folk songs from different parts of Tibet, but adding new lyrics, modern instruments and fresh arrangements. Though certainly very well received by the Tibetan public, the results of these efforts somehow seem to me insipid, possessing neither the energy of good Western popular music nor the charm of the old Tibetan traditions. But, of course, these are the merest of beginnings of this new movement, and I for one, certainly look forward to more exciting musical fare in the near future. Khechog could provide a crucial direction to the course of modern Tibetan music, but for that he would have to work within the Tibetan musical world, which at the moment is splintered, confused, and lacking in conﬁdence and energy. I would like to see a “Year of Tibet” for Tibetans, where among other cultural and artistic events, Tibetan singers and musicians from all over the world, including Nawang Khechog, could gather to swap tunes and ideas, and where they could perform together to entertain, move and inspire an audience of ordinary Tibetan “black-headed people” (the laity) from where it all came in the ﬁrst place.